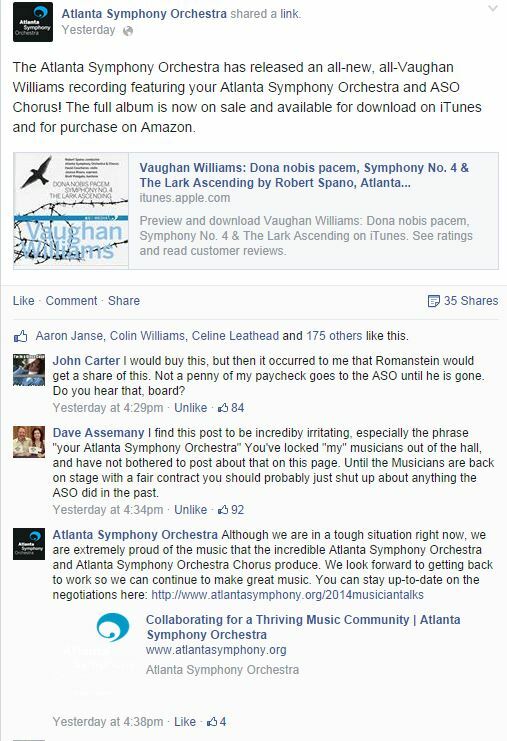 The Atlanta Symphony Orchestra has released an all-new, all-Vaughan Williams recording featuring your Atlanta Symphony Orchestra and ASO Chorus! The full album is now on sale and available for download on iTunes and for purchase on Amazon. Really? You’re refusing to acknowledge your lockout while simultaneously hawking a disc with repertoire including the Dona Nobis Pacem (“Grant us peace”…) cantata…and…The Lark Ascending? Not surprisingly, the management’s obliviousness to the second (SECOND!) (SECOND!) 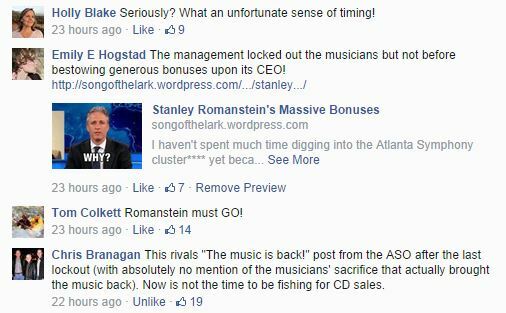 lockout kinda pissed music-lovers off, especially after it became public knowledge that their CEO and board subscribes to the Michael Henson Bonus Philosophy (TM). Unfortunately, the ASO (apparently) didn’t know that Facebook has recently developed a groundbreaking new feature called a “comment section.” And people were, shockingly, using it. And people (for some reason) were pissed! 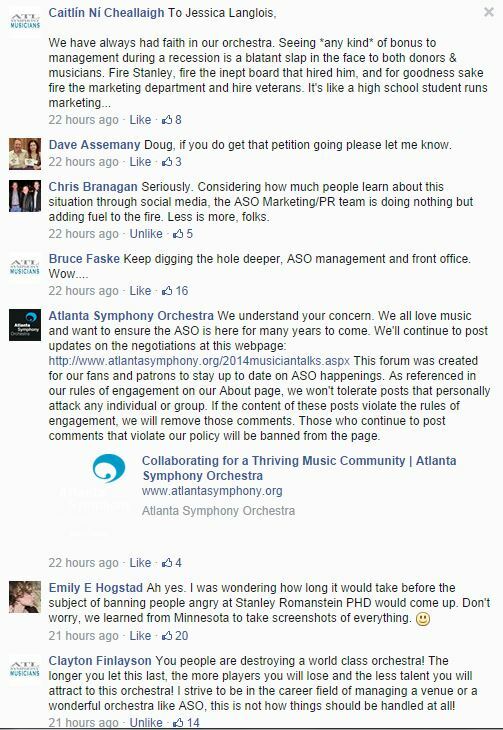 So, on September 10, the ASO’s Facebook page had no choice but to tell its loudmouth online music lovers to SHUT THE **** UP ALREADY, in a long melodramatic statement that would be at home in the mouth of a provocative playground bully who has finally been slapped by one of his younger smaller nerdier classmates and is running to the playground monitor To Tell. So get your tissue box ready! The true victims of the lockout are about to tell their side of the story… I’ll bring out the world’s smallest violin and serenade you. As many of you know, we are currently in the midst of negotiations on a new collective bargaining agreement with our musicians union. Hmm. My BS detector is beeping. 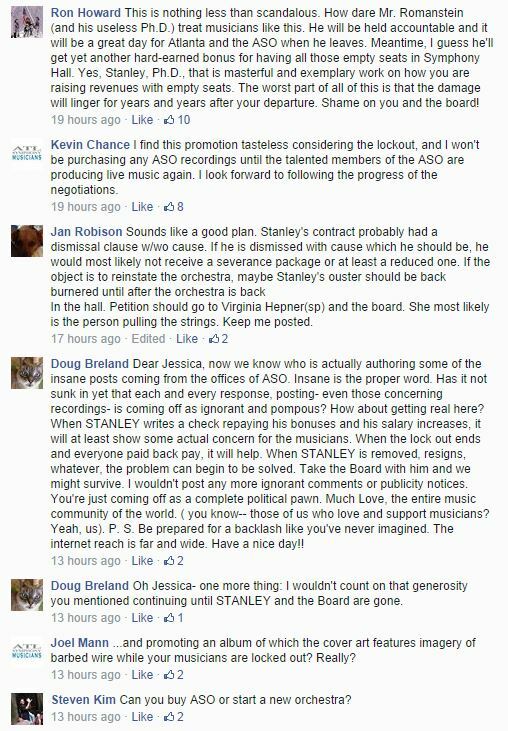 Because here the musicians wrote, “As of midnight September 7th, 2014, ASO President and CEO Stanley Romanstein had refused all requests to meet with the Musicians during the final hours before the 2012-2014 CBA expired,” and I have no reason to not believe them. Maybe the ASO meant to say “we are in the midst of a siege meant to shatter our musicians’ will and spirits.” Curse you, Autocorrect! 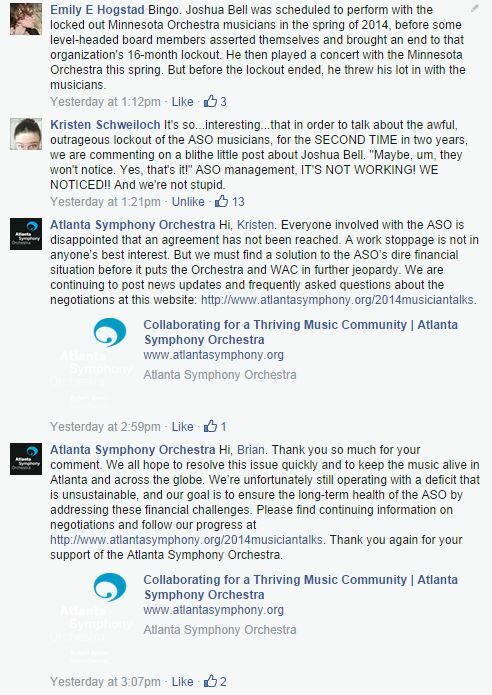 The ASO management team is committed to working toward a resolution that will ensure that Atlanta’s vibrant classical music community can thrive for decades to come. Executive bonuses + ???? = Thriving! It’s not a lockout, guys. It’s A Situation. OMG! Noooo! Anything but UNRELENTING! PERSONAL! ATTACKS! on FACEBOOK! with a blatant disregard for the facts. 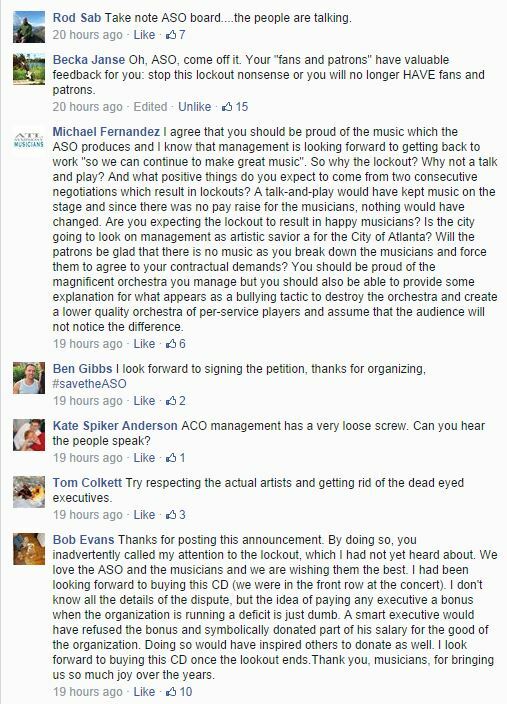 For SHAME, Atlanta music lovers! FOR SHAME. How dare you express thoughts, or….or opinions? Why don’t you want tens of thousands of your hard-earned donated dollars going to executive bonuses instead of musician compensation? What has gotten into you? 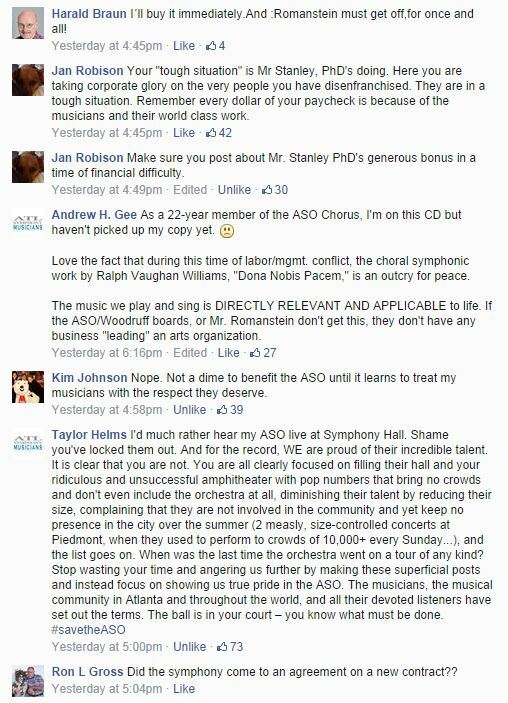 All the ASO has done is locked out musicians twice in two years; that’s all; it’s not that big of a deal; why is everyone so upset? Would everyone just SIT DOWN AND CALM DOWN???? Turning the snarkometer down a notch, after this status was posted, I reread all that had been written, and honestly? I was probably the rudest person there. 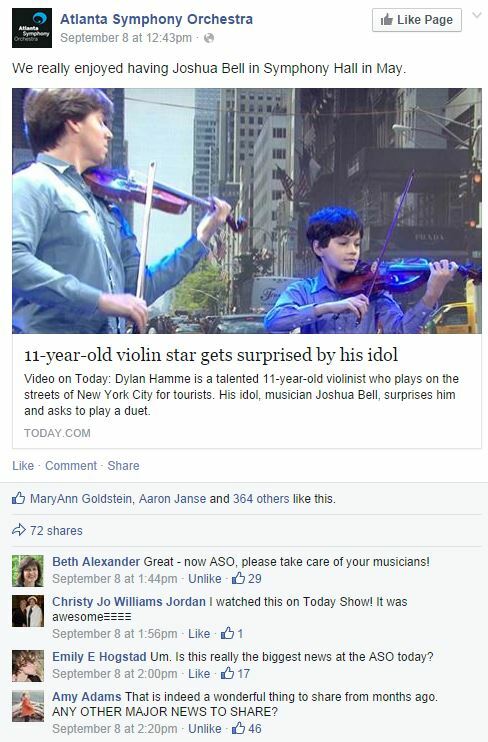 (oops) But I wasn’t talking about Romanstein or the staff of the ASO; I was talking about Michael Henson. 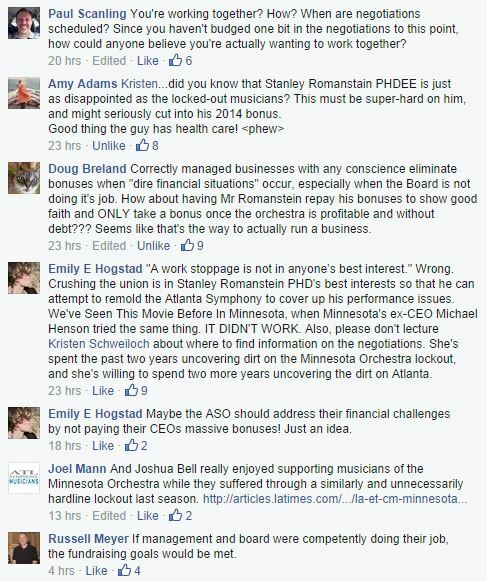 I called him a “failed outcast pariah ex-Minnesota Orchestra CEO” whose approach to arts management is “fiscally and morally BANKRUPT.” And I’m pretty sure that was the worst thing said about anyone on these threads. Lest you doubt me, judge for yourself; at the end of this entry, I’m posting screenshots of the two status updates that spurred the ASO’s sputtery Facebook sadz. we will not let our Facebook Page become a site for hateful language, personal attacks and misinformation. 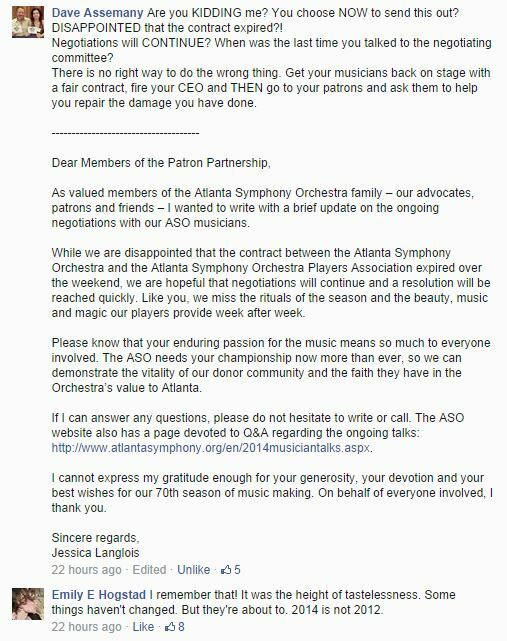 Per our Terms of Engagement, which can be found in the “About” section on this page, we are committed to creating a community that encourages self-expression and mirrors the values of the Atlanta Symphony Orchestra, including respect for the rights, dignity and property of others. As a result of recent posts and comments, we feel it is in our Facebook community’s best interest to disable posting and commenting at this time. We hope to soon return to an open and courteous dialogue with our Facebook community members who wish to express their thoughts and feelings with respect and decorum. Self-expression, just…minus the self-expression…I guess…? Who besides Satan himself wants to mirror the value of an organization that locks out its employees twice in two years? including respect for the rights, dignity and property of others. Whose rights? Dr. Stanley Romanstein, PHD’s right to bonuses? Dr. Stanley Romanstein PHD’s right to dignity? Dr. Stanley Romanstein PHD’s property? I’d like to remind everyone, it’s not his property being disrespected right now. 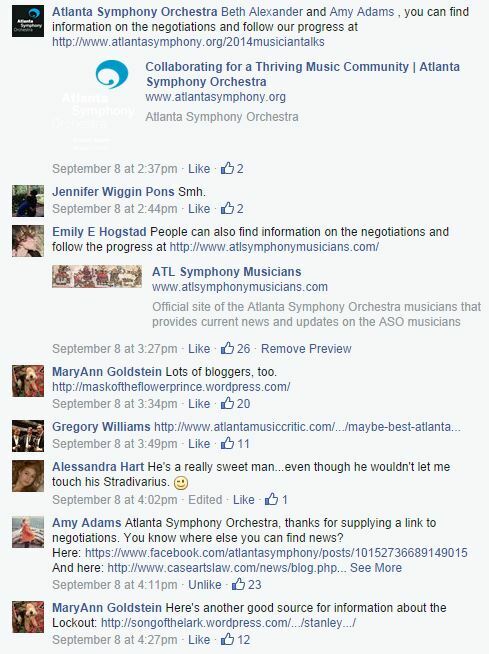 It’s the musicians’ property, and Atlanta’s property, in the form of that city’s world-renowned symphony orchestra. As a result of recent posts and comments, we feel it is in our Facebook community’s best interest to disable posting and commenting at this time. We hope to soon return to an open and courteous dialogue with our Facebook community members who wish to express their thoughts and feelings with respect and decorum. Decorum? What the hell? What do you want music-lovers to do? 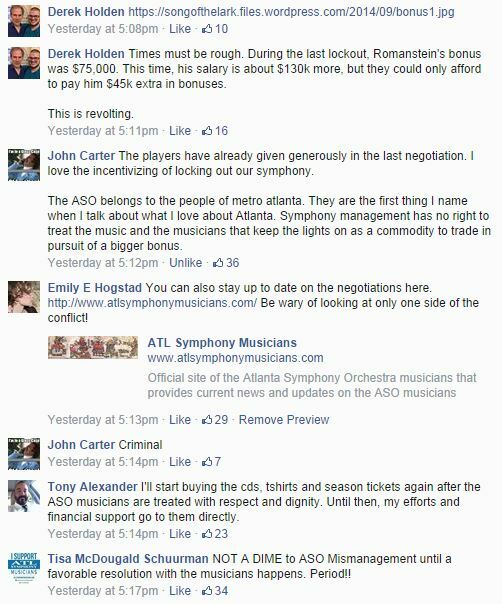 Sit around with mint juleps in our petticoats and wave fans in the heat and say, “I do declare, this lockout is unfortunate…” Why should anyone in their right minds react with decorum to a lockout that threatens the quality, integrity, and size of the Atlanta Symphony Orchestra? Don’t react with decorum, Atlanta. React with anger and action. This is your symphony orchestra these people are hacking away at! 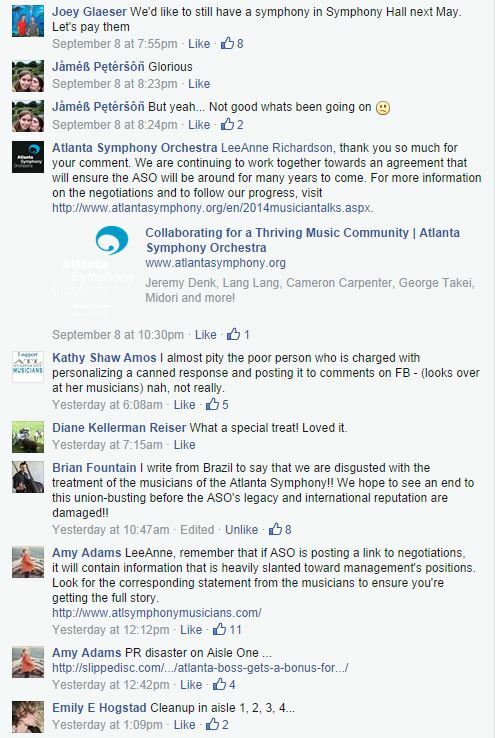 Please stay informed on negotiations and follow our progress at http://www.atlantasymphony.org/en/2014musiciantalks.aspx. I…I can’t. I feel too bad for the fish in the barrel. Don’t make me shoot anymore. Please. The poor fish. Actually I don’t but I’m kinda getting the vibe you don’t care what I think, soooo. 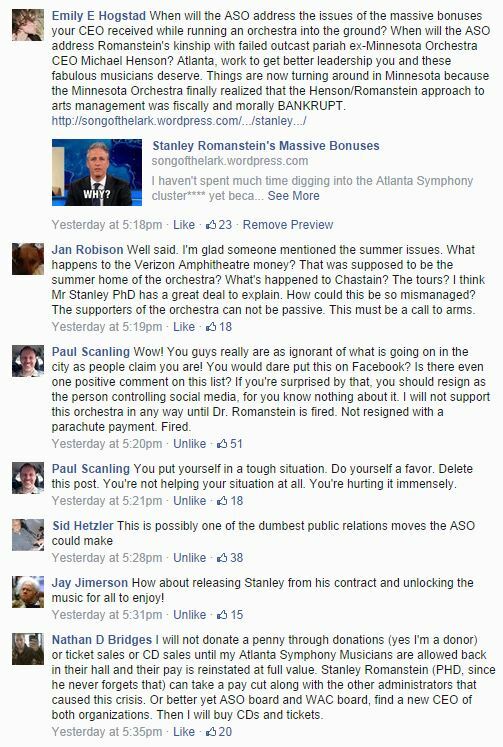 To sum: the Atlanta Symphony Orchestra lit a fire and is now complaining that it’s too hot. Good luck with this PR approach, ASO! Yes, bullies in management really hate being called on their stuff. Too bad. In this day of easy truth-sharing it’s become far more difficult to keep the public in the dark about their nefarious dealings and huge bonuses. Keep up the good work with this marvelous blog. You only forgot one phrase “Bless their hearts!”. Every Southerner knows what that REALLY means! Yes, ma’am. Amen to that. This blog post should come with a disclaimer that eating or drinking is not recommended while reading. I laughed uproariously through the beginning of this post. 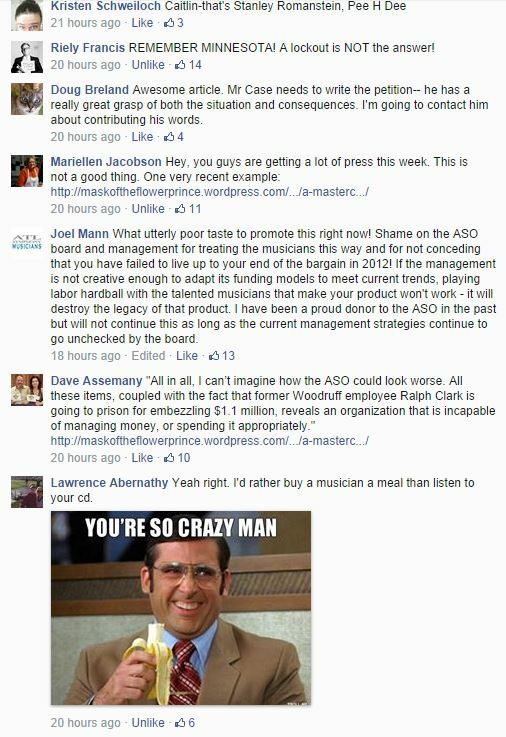 Thank you for your humor, and for the screenshots of the facebook threads that so offended the poor ASO management. Keep it up! I posted a link to this blog entry on the ASO Facebook page. You can’t access reader comments, but the comment box was still live, so I posted the link. My guess is their administrators will delete it, but I thought it was worth trying. Well, that was satisfying. Emily is THE BEST. Can you still review ASO? That worked on the Hartford Wagner Festival… Excellent writing!! LOVE the idea, but I don’t think they allow ratings. You *can* tag them in posts even if you haven’t liked their page, though–which is what I just did with a link to this article. I’m sure that you have already uncovered that Dr. Stanley Romanstein, Ph.D. was the CEO of the Minnesota Humanities Center in St. Paul from 2001 – 2010. Your audience might well be able to shed further light on Dr. Romanstein (Ph. D) from this tenure. Oh yeah. I’m thinking another blog entry delving into Dr. Romanstein PHD’s qualifications is in order. In one of the ASO responses on their Facebook page, they said that there are only 48 employees and that they are one of the most effective staffs in the country. I’m curious how they can call themselves effective when the ASO is running a deficite large enough to warrant locking out its musicians. What are they using to measure something like that? 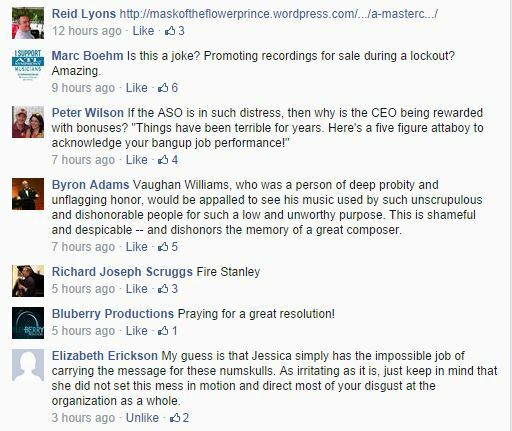 My own observation about the responses from the ASO on its Facebook page is that they all come across like the mechanical voice at a Publix self-checkout: “Please wait for an attendant.” I wonder if they understand that style of response is doing them far more harm than good? Well, Isn’t that special (another great Southern colloquialism). The latest unpleasantness appears to be a result of too much concern about running a business apart from the symphony and too little about making music. 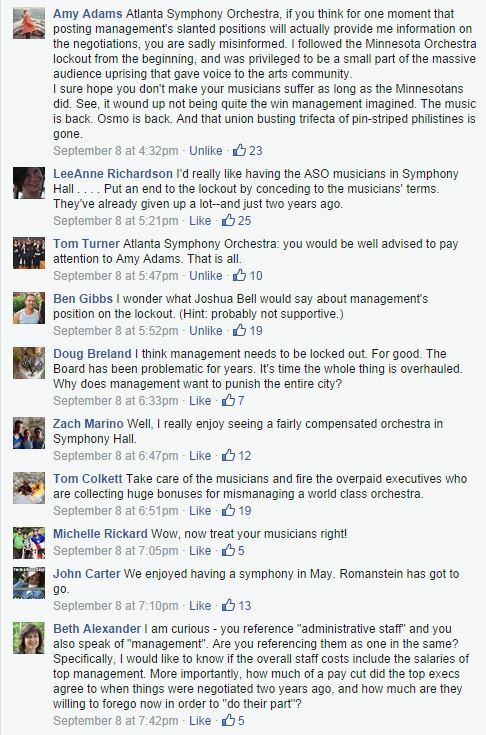 Perhaps it’s time for the ASO to sever their relationship with the burgeoning empire known as Woodruff Arts. This breast has run out of milk! Excellent writing – probably could spice it up with a little sarcasm next time… Honestly, I felt bad for laughing so much since the situation is so sickening. And now they’ve extended the lock-out to their Facebook page! What I don’t understand is why anyone would buy the new recording of Dona Nobis Pacem when there’s already an ASO recording conducted by Robert Shaw, arguably (perhaps) the greatest performance the work has ever received, in spectacular sonics on Telarc. Who needs the new one? Good work as always. Very unfortunate that we still need to be dealing with lockouts but glad that you are here to help. Great job of everyone piling on that comments section – the screen capture is fantastic! Serious question: can a page really disable comments on its own posts? Or can it only delete them as they appear? I understand that making a separate post to the page is disabled. But if the page exists and is posting as itself, the comment box is still there, no? I can’t access comments to the original article, but I added my own comment couple of days ago with a link to Emily’s blog entry, and it’s still there (as I write this). So maybe they are deleting the comments one at a time. I find it interesting that so many commentors seem to feel that the lockout in Minnesota didn’t work. The reason Romanstein is taking a page out of Henson’s (and Parson’s) playbook is that lockouts DO work for managements. Look at Detroit: 23% paycut, 10-13 fewer players, Reduced performing season…Minnesota: 12-14 fewer players, 15% paycut, reduced performing season. Voila. reductions achieved. These heinous tactics are being used by the most nefarious of the managers because they work. Those with any sense of decency, and perhaps some knowledge of music, can’t quite bring themselves to do it yet. Just wait. This is backdoor union busting at its most despicable, and we will see more of it. Art, quality, reason…not on the table for them. We could have an interesting discussion about that, and I totally see where you’re coming from, but I also disagree. I don’t know all the ins and out of Detroit, so I won’t comment, but the Minnesota situation I do know. Economically, the Minnesota lockout saved millions of dollars, both from the resulting contract and from the months of not paying musician salaries or benefits. It also LOST the organization millions in ticket revenue and million in donations, and probably around a million for buying out Henson’s contract, and imperiled millions in funding for years to come. (Foundations, for instance, are much less willing to support Minnesota now than they would have been, because they’re concerned – with good reason – that this is an organization that can’t get things done, and therefore won’t be a wise investment.) Not sure holistically speaking that the management came out ahead. And if the artistic and administrative changes post-lockout had not occurred, even more major donors would have jumped ship. 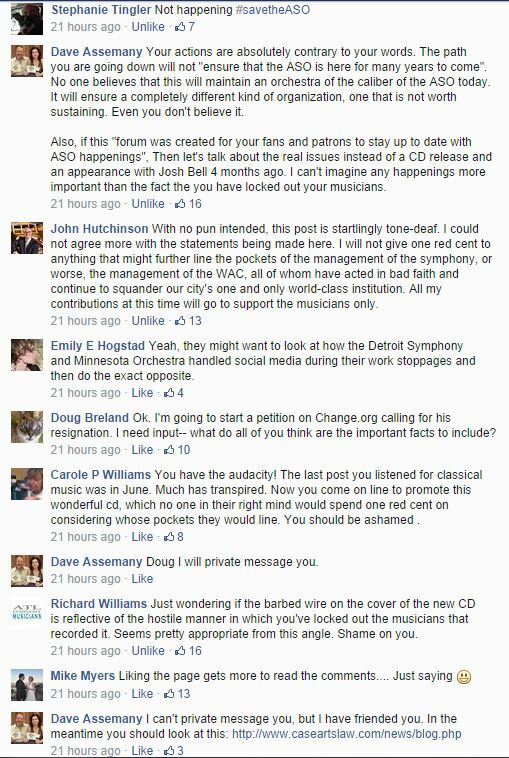 The Minnesota musicians most likely would have accepted the final deal if it had been offered in October 2012 (if not that deal, then one close to it). If the management had gone down that path, voila, the expense reductions management wanted without the loss of ticket revenue and not having to buy out Henson’s contract and without the public acrimony staining the brand. So yes… My perspective may ultimately change on this one, but right now I feel this way. The lockout may have gotten management some things, but I doubt it got them any more than what they could have gotten in good faith normal negotiations. Except a mobilized pissed-off public. It got them that. I agree with you on your last point, but across the table the core personnel reductions would have been a potentially intractable battle; which they avoided (and achieved) by locking the players out. Many of those reductions can be virtually permanent as management hedges its promises to rebuild to former numbers with every subsequent negotiations, where they will have new figures showing the need to retain the reductions. I worry that any management capable of acting the way ASO management is currently doing WILL see the previous lockouts as successful– if they did in fact get pay cuts and position cuts, they will calculate that as “Success” without bothering to think out the lost revenues or lost status. In short they may refuse to think “holistically” about the overall results. Especially if their underlying goal with this tactic is union-busting! According to this alleged “new” and “flexible” business model, labor simply is an indistinguishable, interchangeable part they are determined to get at the cheapest possible rate; ant musician sitting in the seat will do, and you should only pay the extreme minimum amount you can to get *some* live person in the seat (and as few seats as you can possibly get away with to produce product). If the musicians don’t like it, they can go apply to play at some other company… they are “worth” only the very least for which anyone can be persuaded to do “the task”. To whom would it be most effective we direct mail demanding the replacement of this CEO with a decent one, along with the replacement of whoever chose this CEO and authorized rewarding him so richly for the mess he is making?